As a Wagnerian, the young Mahler took the Wagner-Liszt views on ‘the music of the future’ very seriously. Yet at the same time something in Mahler fought against the idea of viewing Beethoven merely as the inspired prophet of the Lisztian symphonic poem or the Wagnerian ‘total work of art’. 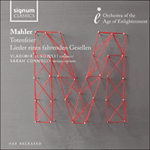 Mahler’s first three symphonies see him struggling to reconcile these opposing urges. When his purely orchestral First Symphony first appeared in 1884 (around the same time as Lieder eines fahrenden Gesellen) it was entitled ‘Symphonic Poem’ and came with an explanatory programme, linking it to Jean-Paul Richter’s once hugely influential novel Titan. But before long Mahler had begun to lose faith in programmes. People would go taking them literally, like the old Russian lady who asked him to describe heaven for her—surely not a problem for the composer of the ‘Resurrection’ Symphony? By the time he came to write his Fourth Symphony he had dispensed with literary props altogether. Something of this inner conflict can be sensed in the indecision that marked the early stages of composition of the Second Symphony (the so-called ‘Resurrection’ Symphony). Mahler began work on a huge symphonic funeral march in the summer of 1888. At first he seems to have viewed it as the first movement of an orchestral symphony; but before long the conception had changed, and Mahler was looking on this movement as a self-standing symphonic poem with the title Totenfeier—‘Funeral Rites’. Eventually this was revised, but not essentially reconceived, as the first movement of the Second Symphony. Totenfeier is scored for more modest orchestral forces than the later symphonic version (though they are still large by the standards of the time). It was only later that Mahler added the second harp and set of timpani, the two piccolo clarinets and the four extra brass. Yet the colours remain more or less the same. We also find broadly the same narrative sequence: the harsh tones and jagged rhythms of the opening march theme are offset by a gentler, aspiring melody in the major key. The opposition between these two types of music—grim pessimism and tentative aspiration—continues through all the changes of tempo, texture and key that follow. But in Totenfeier, as in the Second Symphony’s first movement, it is death who finally proves the victor: a brusque falling scale ends pathetically in hush, and extinction.